This week will be dedicated for Valentine's and Chinese New Year theme. As the Valentines's Day and Chinese New Year will be in the same day this year on 14th February, 2010. I made this 'love' bento to start this busy week. And love in the box is for all my bento friends. Unfortunately we do not celebrate Valentine's Day anymore in the 'special day' sense. We celebrated it everyday in our 13 years of marriage :) just had the Wedding Anniversary last week. But thanks to my husband's job... he left me alone with a big flower bouquet, a card, a new Magic Mouse and two kids ... LOL :D He had to travel last week, something that we can't avoid. Inside the box : (1st box) rice with a lot of hearts at the top from carrots, cucumbers and egg. (2nd box) pork sausages wrapped with beetroot noodles, broccoli with heart shaped sprinkles from crab stick, corns, strawberry and veggie pastry. That bento is so lovely. I adore all the hearts and everything looks so tasty. 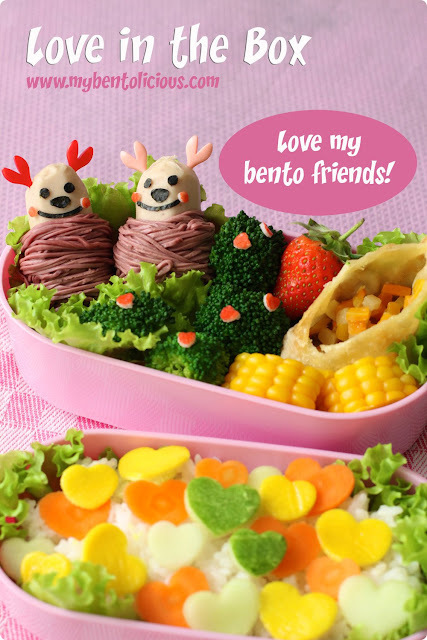 such a sweet bento valentine to your friends -- i love it! the multi-colored and layered hearts are a truly beautiful effect! Happy Valentines Day to you too Lia! I love the happy friends and all the colorful hearts! You always make your bento look sweetly detailed with love. So pretty! WOW! I love both presentations. So perfect can post up in magazine. So cute and full of LOVE! :D The pork sausage people are great! Lovely bento as always Lia! Your bentos always make me drool! @Anncoo : Thanks a lot Anncoo for your very nice comment! You are so sweet. @pigpigscorner : Thanks a lot Ann! Ahhh..."Love is in the air..." I'm excited that you will be doing both Valentine's and Chinese New Year themes this week. I can't wait to see. 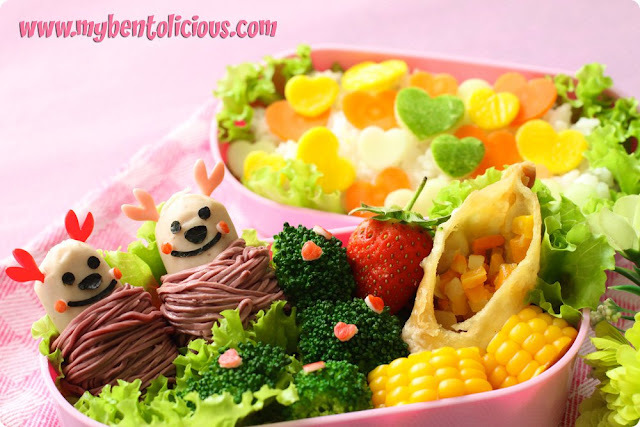 Such a pretty bento and beautiful photos, Lia! Oh the cutest bento! I'd love to try the beetroot noodles. Though I regret you'll have the memorial day during your husband's absence, have a happy Lunar New Year with your kids. And... Happy wedding anniversary! !